For you Kydex newbies, Kydex is basically an acrylic/PVC thermoplastic sheet that is frequently used as an alternative to leather in the production of firearm holsters and sheaths for knives. The benefits of Kydex are that it is lightweight, thin, durable, and provides excellent retention for whatever application you use it for — be it sheaths, mag pouches, flashlights, or holsters. Although Kydex holsters and mag pouches have been around for some time now, only in the recent decade do we see the competitive-shooting and military communities embracing them — and if you haven’t yet, I’d recommend you do too. Given its many benefits, I figured I’d pass onto you how you can make your own custom Kydex gear. Since making a Kydex holster is one of the more complicated of Kydex crafts, if you haven’t yet I’d highly recommend you first trying to make a Kydex mag pouch to better understand how to work with Kydex (you can see instructions by visiting the following link: how to make your own Kydex mag pouch. Once you’re comfortable with that, making a holster will not be much more difficult. Place the pistol on the sheet of Kydex that will be closest to the waistband. Leave around a 2-inch gap of kydex above the slide, a 1-inch gap in front of the muzzle, and no gap along the side of the handle. Now, with the reduced dimensions, draw an outline of the pistol making sure to keep the 2-inch gap of kydex along the slide and the 1-inch gap in front of the muzzle. If you want the non-reflective dull side to be on the outside, be sure to draw the outline on the shiny side. Next, draw out an area that is to be removed from the Kydex to allow access to the grip when you draw the pistol. Score and remove that area. Step 6:Prepare to form the Kydex by turning on your oven to about 220 degrees Fahrenheit. 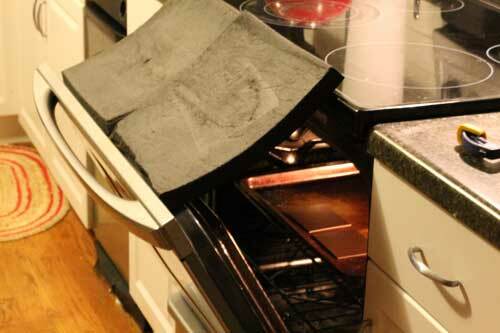 Place both Kydex halves on a cookie sheet and place in the oven with the door partially open. I like to also lay the sheath foam between the oven door and the stove top to warm up the foam. Warming up the foam will help to create a more defined Kydex mold. If you keep the foam at room temperature, it will draw out the heat from the Kydex causing it to cool too fast which will prevent a nicely defined mold. With gloves on, every few minutes pick up the Kydex to determine if it’s soft and begins to bend. Once it begins to soften and bend, heat up the pistol with a hot hairdryer or heat gun (this also helps to create a defined mold). Once the Kydex is very flexible and floppy and the pistol is warm, remove one of the pieces of foam from the oven door and place it on one of the wood boards. Finally, place the other warm piece of foam on the magazine and Kydex, followed by the other wood board. Clamp down the two halves of the boards over the foam like a sandwich. Be sure to securely clamp it down — the more pressure the more defined your final product will be. Step 12:Draw a sketch of your holster design on both of the halves as follows and cut out the sections not part of the sketch. Step 13: After cutting out the designs, place both halves together (with the pistol in the middle) ensuring that both sides are flush. Don’t worry if there are any overlapping sections, since these can be fixed later. Step 14: Now that both halves are cut out, draw holes where you want the rivets to be. Step 15: Now begin drilling out the holes that you drew in the previous step. Be sure to keep the magazine in-between the two halves to ensure proper alignment. Step 16: Using the rivet die, begin installing the rivets (eyelits) where the holes are. Step 17: After installing all of the rivets, you’ll probably notice that there are slight alignment issues between the two halves. To fix this, use a belt sander, file, or heavy sand paper and start sanding the edges so they even out and become aligned. Step 18: The previous step will leave a rough finish on the edges. Now it’s time to clean them up using a fine grit sand paper. Step 19: Viola! You now have an effective and beutiful Kydex holster! What I also did (as you can see in the pics below) is took a heat gun to the edges of the holster to bend them slightly in. This helps to mold it to the body better. In addition, don’t forget the belt loops. These are simply made by cutting strips of Kydex, heating them up and bending them into the shape you desire. KnifeKits.com: This is where I get all my Kydex supplies. PhillyEDC’s YouTube channel: This is a great YouTube resource on all things Kydex. Much of what I’ve learned I owe to PhillyEDC. Thanks brother if you see this! GunFightersInc’s YouTube channel: Another great YouTube resource that features some innovative ideas and concepts around Kydex forming. James Wesley Rawles, former miltary intelligence officer, preparedness expert, and editor of SurvivalBlog.com is forecasting another crisis here in the United States beginning this Fall which will unravel throughout the next 24 months. “Inevitably what’s going to happen is a certain chain of events: We’ll have chaos in Europe. We’ll probably see a banking crisis there (full scale bank runs, banking holidays etc). Interest rates will spike, but then the credit rating agencies…are going to downgrade the United States… That is the key trigger event… When that happens we will be no better than Greece and we will go through our own crisis, but on a grand scale. The danger of bank holidays here in the U.S.
“Basically a bank holiday (which we haven’t seen in the United States since the 1930s) would be a government mandated closure of part or all of the banks of the United States to stem off the flood of withdrawals that would take place if we had a bank run. “All of the SNAP payments which are on EBT cards now (they used to be food stamps)…are negotiated through the bank check-clearance system. So if they shut down the check-clearance system they also are going to shut down food stamps. “In the short term we’re going to see a mix of both inflation and deflation simultaneously…in the long run though, it will be nothing but inflation and more inflation. “I don’t think it can be avoided at this point. Now it could be delayed quite a while. They might have a currency reform here in the States…They might even do something as severe as dropping a zero or even two zeroes off the dollar. Which would cause and overnight boost to the economy…and will give people the illusion of prosperity in the short term…to carry us over. But in the long term, things are going to break down. We will see a full-scale economic collapse. It’s…inevitable. “I think battlelines are being drawn. Just like in World War II with Ally and Axis powers, we could very well see a situation much like World War II where these cabals are formed. It will be interesting to see where Iran ends up, where Russia ends up, where China ends up. Something tells me that the United States is not going to have a lot of friends in World War III . “The level of civility in our society is dropping. The sissification of our society is definitely in full swing. Very few people are willing to stand up for what’s right. They want to go along and get along and create as few waves as possible. We live in a society of sheep…sheeple. We have an overweight generation, and undereducated generation, and a generation that’s fixated on their day-to-day pleasures, and when true hard times come they are going to be completely unprepared. “We live in a sissifed generation and a dumbed-down generation. And unfortunately we’re going to see a massive die off. I can’t see any other solution. Unfortunately it’s going to come to that. It won’t be anything that we precipitate. We’re just going to be spectators but hopefully we’re going to pull through this. “I think it’s important that people get prepared. People need to keep a lot more cash at home and…a good chunk of that should be in 5 cent coins (in nickels) because it’s the only currently minted coin in the united states that’s worth it’s face value — everything else is just a token. People need to get prepared for this coming banking crisis. I think we will have a delay before it takes place here in the United States because the dollar and U.S. investements will be seen as a safe haven, temporarily. This is your window of opportunity folks. Get a wad of cash, and it should be in $1 and $5 dollar bills. Not large bills because you’re going to need to be able to make change. Because if there is a banking crisis, people are going to need to resort to cash for just about everything. “The crucial thing is you want to be on the side road of a side road. You don’t want to be on any natural line of drift for people fleeing the cities. “The people who are well armed are not going to get picked on. It’s just like urban crime, the people who get picked on are the most vulnerable: the elderly, the infirmed, and the unarmed. “People need to make plans for a world without the internet in the worse case and it’s important that people go to their favorite websites and look up the dotted-quad/IP address and literally write down and…carry that in your wallet. For the more advanced computer users…you need to explore what’s called the Dark Net. Do a web search on “dark net” and get yourself set up. It’s not as easy to use as the internet through a standard web browser but it’s important that people develop a presence in the dark net so that if the main internet dissapears some day…there’s a good possibility that the dark net will still be up an running. You also need to get set up with a Bitcoin account so that you can transact business on the dark net. It may become crucial in the next couple of years because the internet as we know it may be either partially or completely taken away from us. Beyond the darknet the other thing I recommend people do is get themselves licensed as amateur radio operators…because if the internet goes down, we could see a situation where there’s martial law. Unless patriots can communicate we’re going to be powerless. For those not familiar with Lisa Bedford (aka “The Survival Mom”), she is a wonderful lady who has a fantastic blog that I enjoy following (and you should check out too). Well, a few months ago I got her book entitled “The Survival Mom” but did not have the chance to read it until recently and let me tell you…I wasn’t disappointed. Much like her blog, Lisa’s book is jam-packed with a ton of practical information related to emergency preparedness. 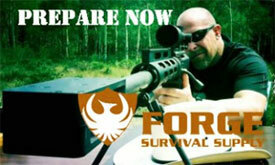 If you’re a hard-core survivalist with a fully-stocked retreat and a huge stash of weapons, this book may not be for you. But then again that’s not who The Survival Mom is targeting. The Survival Mom is a perfect match for your average, every-day suburbanite and apartment dweller who wants to get prepared. And best of all, it helps get them to do it through a chalk full of checklists, helpful tips, and personal examples so as to keep them organized and committed to staying on the path. Lisa is able to teach and inform with a no-pressure approach that takes away the “overwhelm” that many survival guides instill. It’s organized into small easy-to-read sections that you can come and go to as you please and consume what you need to know at the time you need to know it. 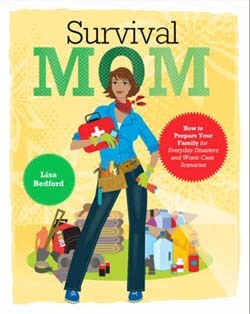 And just because it says “The Survival Mom” doesn’t mean that there isn’t plenty in this book that us guys can learn from. The greatest benefit I found to this book is that it’s an excellent primer for those of us with wives who aren’t quite on board with our prepping “obsession”. 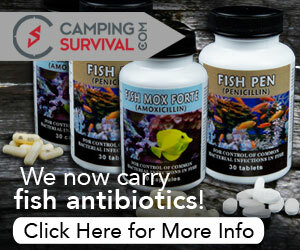 The Survival Mom really does an excellent job at bringing prepping to the masses and any prepper newbie reading this will not be turned off with any of the “end-of-the-world” fear mongering that other survival books push. Personally, I think a lot more can get done with the carrot instead of the stick. Well done Lisa, you get my vote with this one. Although I do receive a small commission if you purchase through this link, in no way does it affect my review of this book. It’s definitely highly recommended! 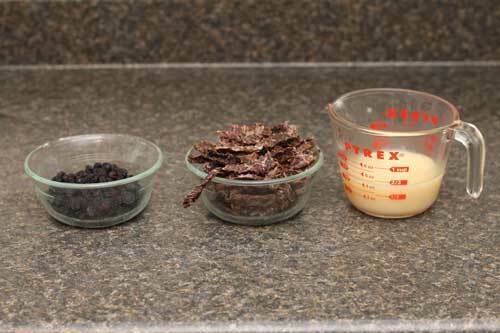 Invented by the natives of North America, pemmican is the original MRE. 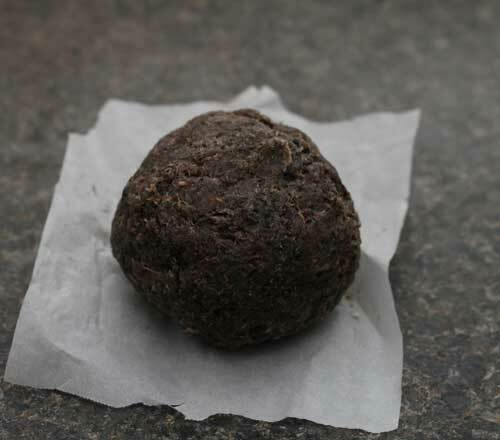 Pemmican was used by indian scouts as well as early western explorers as an instant, ready-to-eat, high-energy food. It was light, compact and high in protein, good carbohydrates, and sustaining fats. During my college years, my friend and I would use this (in addition to any wild edibles we found) as a primary trail food when doing extended “survival trips” during our southern-Utah explorations. 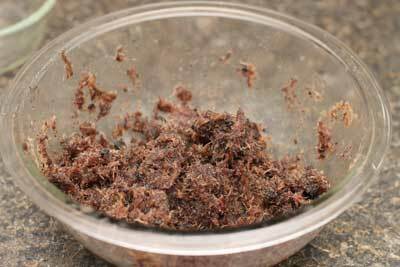 Based on personal experience, pemmican is very sustaining and I found it far superior to any MRE or other trail food out there. It not only provides a lot of energy in a small package, it will also keep for many years. 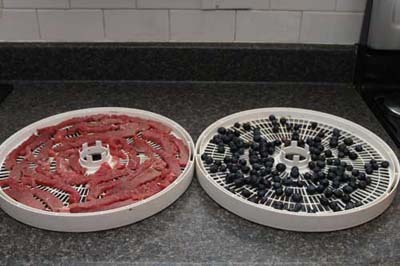 In the photo above I used my home dehydrator. In college, since I didn’t have one, we would simply sandwich the meat and berries between two window screens and set them out in the sun to dry for a day or two. It was just as effective. 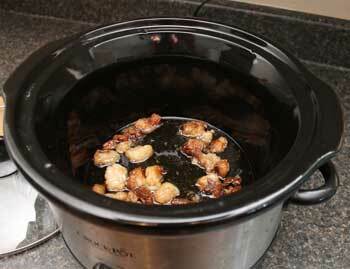 Cut up your fat in small pieces and place the fat into the crockpot. 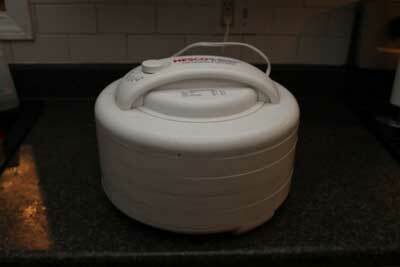 Set the crock pot on low heat. Cook until you’re left with mostly clear or golden liquid (they’ll be bits of hardened stuff on top). Remove from heat and strain into a mason jar through a metal strainer lined with a coffee filter, paper towel or cheesecloth. Place a pan on the stove and add the ground fat. Set the heat on the lowest possible setting. Cover and let cook, stirring occasionally. Cook until you’re left with mostly clear or golden liquid with bits of hardened stuff on top. 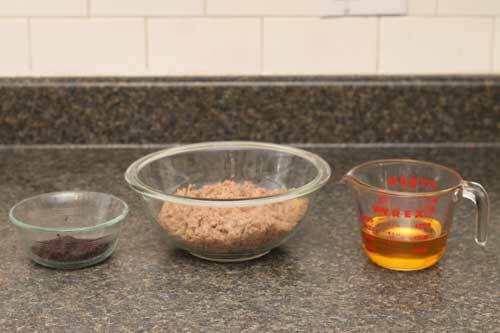 Pour the liquid rendered fat over the meat/berries until it becomes somewhat saturated (if your fat has already turned to a solid, be sure to slowly heat it until it turns back to liquid before doing this step). 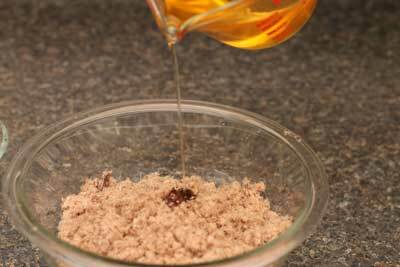 If you dislike the idea of using animal fat as a binder you can replace it with honey instead. 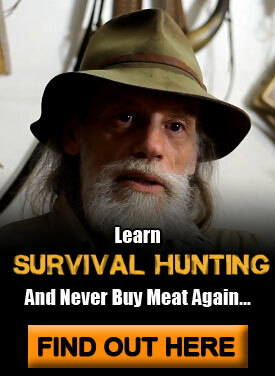 It will keep for a long, long time just as normal pemmican will. Just keep adding honey to the dried, shredded meat and berries until it binds enough to form it into a ball shape. Although this option is a lot more tasty, personally I don’t like the sugar rush (and resulting crash) I get when eating this while out in the bush or on the trail. 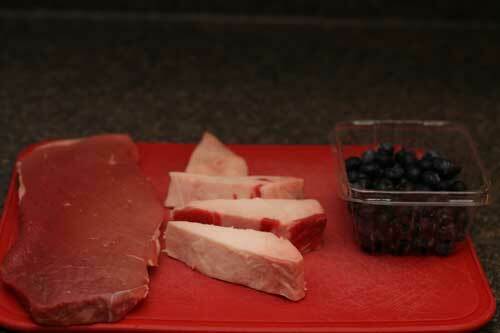 Using fat as a binder seems to provide a lot more stable of an energy throughout the day.